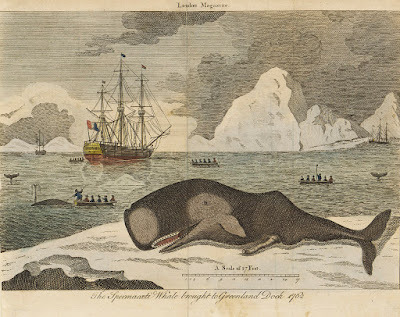 The Spermacaeti whale brought to Greenland Dock 1762, artist unknown, 1762, National Maritime Museum. In the cold waters of the North Atlantic, a small squadron of whalers deploy the boats to harpoon their prey. Driven up onto the ice is a surprisingly clean looking whale corpse. 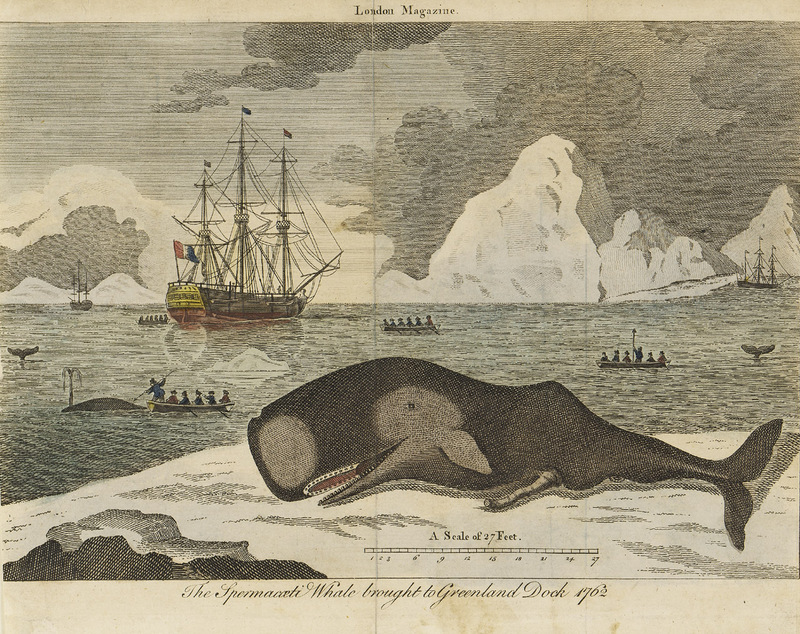 The artist is likely depicting a particularly sizable whale, one worthy of capturing on paper. The first thing I noticed in this piece was the anachronistic flag on the whaler in the left of the frame. 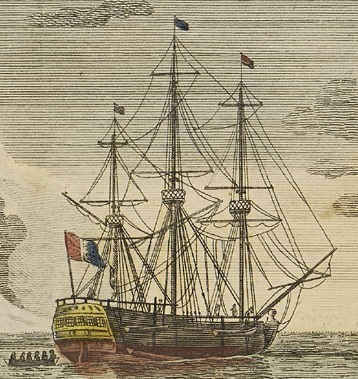 The French tricolor flag did not exist until the Revolution, and so would not have been flown on a whaler in 1762. A closer look reveals that the flag is actually the Union Jack, and that some subsequent colorist sought to re-brand the original image at at later date. If not for obvious anachronisms like this, it would be nearly impossible to tell when a colorist comes along later. This is one of the pitfalls in relying solely on primary source images in a study such as mine. Always be open to questioning your sources and rounding out your knowledge with other sources. Our sailors are clad in blue and red jackets, cocked hats, and round hats. Have you found any other images of whalers in the course of your amazing detective hunt? Only this one. I'm a little surprised I haven't come across more.